NanoTech Entertainment ( OTCPINK: NTEK), a pioneer in bringing the 4K Ultra HD experience to consumers, announced today that it has signed a U.
NanoTech Entertainment ( OTCPINK: NTEK), a pioneer in bringing the 4K Ultra HD experience to consumers, announced today that it has signed a U.S. distribution agreement with Ingram Micro Inc. (NYSE:IM), the world’s largest wholesale technology distributor and a global leader in IT supply-chain and mobile device lifecycle services. 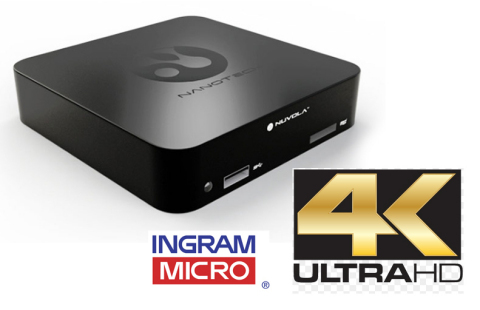 Under the nationwide agreement, Ingram Micro will distribute NanoTech’s Nuvola NP-1™ 4K UHD streaming video player, the world’s first streaming media player that supports 4K Ultra HD movies and videos, to channel partners in the U.S.
NPD DisplaySearch’s most recent research indicates that 1.9 million Ultra HD/4K TV products will ship this year and jump to 12.7 million units in 2014. The Nuvola NP-1 is powered by a NVIDIA® Tegra® 4 Quad Core Mobile Processor with 2GB DDR3 RAM and incorporates 72 custom NVIDIA GeForce ® GPU cores to deliver enormous processing power and realistic graphics. More than a 4K streaming media player, the Nuvola will work with any brand, any resolution of television and isn’t limited to just playing downloaded 4K content—it streams content. In addition to being able to decode 4K Ultra HD content, the Nuvola NP-1 can decode HD, SD and 3D movies, the device plays state-of-the art 3D Video games. It can also stream content from a variety of sources, including the bundled UltraFlix™ 4K Ultra HD channel, which serves 4K content for streaming; and other services such as Netflix, Hulu Plus, XBMC, Amazon Instant Video and YouTube. Ingram Micro is the world’s largest wholesale technology distributor and a global leader in IT supply-chain and mobile device lifecycle services. As a vital link in the technology value chain, Ingram Micro creates sales and profitability opportunities for vendors and resellers through unique marketing programs, outsourced logistics and mobile solutions, technical support, financial services and product aggregation and distribution. The company is the only global broad-based IT distributor, serving approximately 160 countries on six continents with the world’s most comprehensive portfolio of IT products and services. Visit IngramMicro.com. Headquartered in San Jose, CA NanoTech Entertainment is a technology company that focuses on all aspects of the entertainment industry. With five technology business units, focusing on 3D, Gaming, Media & IPTV, Mobile Apps, and Manufacturing, the company has a unique business model. The company has a diverse portfolio of products and technology. NanoTech Gaming Labs operates as a virtual manufacturer, developing its technology and games, and licensing them to third parties for manufacturing and distribution in order to keep its overhead extremely low and operations efficient in the new global manufacturing economy. NanoTech Media develops proprietary technology which it licenses to publishers for use in their products as well as creating and publishing unique content. NanoTech Media Technology includes the world's first Ultra HD 4K streaming solution. NanoTech Communications develops and sells proprietary apps and technology in the Mobile and Consumer space. Clear Memories is the global leader in 3D ice carving and manufacturing technology. 4K Studios creates digital Ultra HD 4K content using both licensed materials as well as original productions. NanoTech is redefining the role of developers and manufacturers in the global market. More information about NanoTech Entertainment and its products can be found on the web at www.NanoTechEnt.com. "Safe Harbor" Statement: Under The Private Securities Litigation Reform Act of 1995: The statements in the press release that relate to the company's expectations with regard to the future impact on the company's results from new products in development are forward-looking statements, within the meaning of the Private Securities Litigation Reform Act of 1995. Since this information may contain statements that involve risk and uncertainties and are subject to change at any time, the company's actual results may differ materially from expected results. The NanoTech Entertainment logo, UltraFlix, NanoFlix, NanoTales, NanoBooks, Nuvola NP-1, Nuvola NP-C, Nuvola GP-1, Nuvola RF-10, Nuvola NP-H1, Nuvola SC-1, Nuvola TV-U1are trademarks of NanoTech Entertainment, “The Future of Television” and “The Future of Entertainment” are service marks of NanoTech Entertainment, Inc. All Rights Reserved. All other marks are the property of their respective owners.